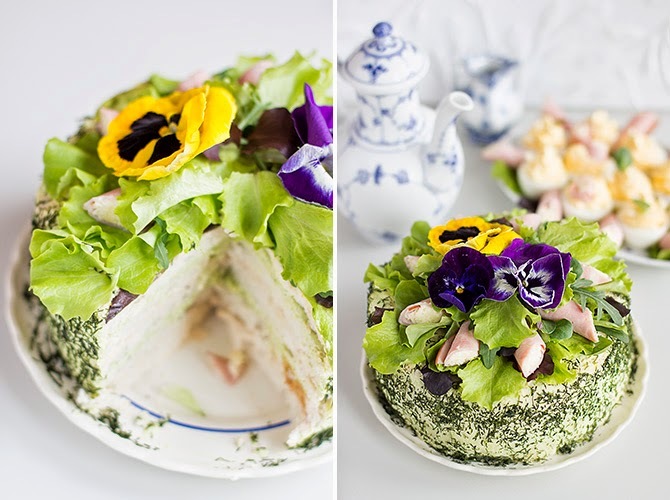 Spring is here and so is my sandwich cake. 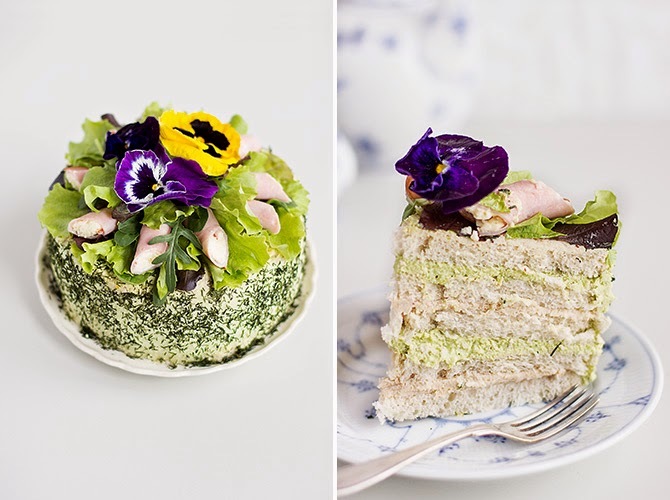 It was actually news to me that there are people out there that find sandwich cakes funny. Umm.. it's like a giant well-organised sarnie that has been fancied up a bit. Smoked chicken and rocket smörgåstårta. To make the chicken filling, simply process the chicken in a food processor together with mayonnaise, sour cream and Caesar sauce to a homogeneous paste. To make the rocket filling, bring butter to room temperature and blanch rocket and herbs in boiling water for a minute, refreshing in cold water. When cooled, lift out of the water, squeeze dry and place into a food processor with the cheese. In another bowl, cream the butter. When the herb and cheese mixture is pureed, add it to the butter, bit by bit. Taste to see if it needs salt or pepper (some cheeses are salty whereas others are not). Divide the toast into five piles, all consisting of four slices. Cut the slices into triangles. Take eight triangles, arrange as a pinwheel, trimming the outer tips, to make a circle. That is one layer. I seem to prefer round cakes. Place the first layer of toast on a platter, spread with one third of the chicken filling and top with another layer of toast. Now spread these with one third of the rocket filling. The filling should be thicker than what you'd normally put on your sandwich. Continue to stack and spread until you run out of toast but should be left with one third of rocket filling (the last third of chicken filling goes on top). Mix the last third of rocket filling with the 20g of butter (to make it firmer) and stick in the fridge for about 15 minutes. Then use it to cover the sides of the cake all over with rocket butter. Sprinkle with finely chopped herbs. Just before serving, cover the top with salad leaves and ham rolls.